WASHINGTON — The National Capital Area Political Science Association awarded Jeff Biggs with the Walter Beach Pi Sigma Alpha Award this afternoon at the American Political Science Association’s (APSA) headquarters in Washington. Dr. Biggs served as director of the APSA Congressional Fellowship Program from 1997 to 2014. 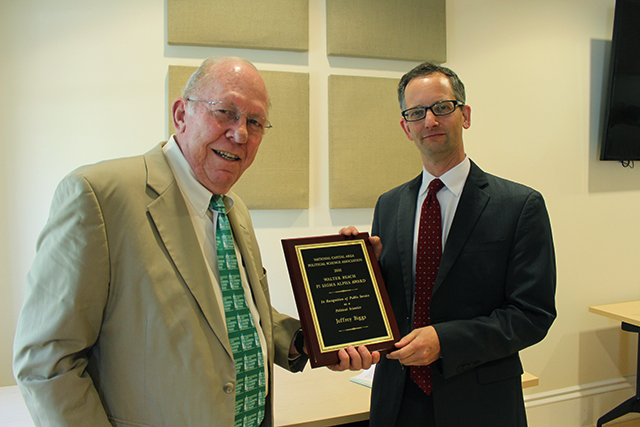 The award recognizes Dr. Biggs’ “substantial contribution to strengthen the relationship between political science and public service,” NCAPSA president Matthew Green noted. The award is named after Walter Beach, a founding member of NCAPSA who also served as a director of the Congressional Fellowship Program and associate director of APSA. “Jeff is a rare breed: someone who is a scholar, has worked in government service for many years, and spent nearly two decades bringing together hundreds of young scholars and policy-makers, contributing to the professional development of both,” Dr. Green said. Dr. Biggs also is an alumnus of the Congressional Fellowship Program. Established in 1953, the program enables select political scientists, journalists, federal employees, and other professionals to experience Congress at work by serving fellowship placements on congressional staffs. Before joining the APSA staff, Dr. Biggs spent twenty-one years in the Foreign Service and was named as a Foreign Affairs APSA Congressional Fellow in 1984, serving with Congressman Thomas Foley (D-WA) and Senator Alan Simpson (R-WY). He later served on then-Majority Leader and later-Speaker Foley’s senior staff as press secretary and spokesman from 1987 to 1994. At today’s award ceremony, Dr. Green conveyed remarks from several CFP alumni who spoke of Dr. Biggs’ influence on their careers and his expertise on Congress. “I would venture to say that no one single person affected my career more than Jeff Biggs, because he somehow turned an [American Political Development] presidential scholar into a Congress lover and watcher,” said Colleen Shogan, Deputy Director, Congressional Research Service and former president of NCAPSA. Dr. Biggs is a co-author with Thomas S. Foley of Honor in the House: Speaker Tom Foley, author of A Congress of Fellows: Fifty Years of the American Political Science Association Congressional Fellowship Program 1953-2003, and a number of journal articles. Dr. Biggs retired from APSA in 2014. APSA’s Kara Abramson contributed to this report. Throwback Thursdays: 2015 Opening Reception – San Francisco, Calif. Echoing Dr. Shogun’s comments, Dr. Biggs was singlehandedly responsible for giving this international relations professor incredible insight into the connection between the American political system and world politics! Congratulations Jeff! You deserve the recognition. Jeff made the connection between scholars and practitioners something that was both doable and a benefit to both groups. Over the years of our association both during his Hill career and his time at APSA, I can truly say I rarely met anyone with his ability to work with people of all possible political persuasions. I’m sorry that I am in Germany now, and could not be present to witness the award in person. Best wishes to you, Jeff.